Waffles are an institution in my family. A big, giant waffle breakfast is one of the key Christmas morning traditions at our house growing up, and breakfast for dinner has always been a regular part of the rotation. So, I pretty much love my waffles any way I can get them–oatmeal, lemon, mixed berry, gingerbread, pumpkin… I love them all. 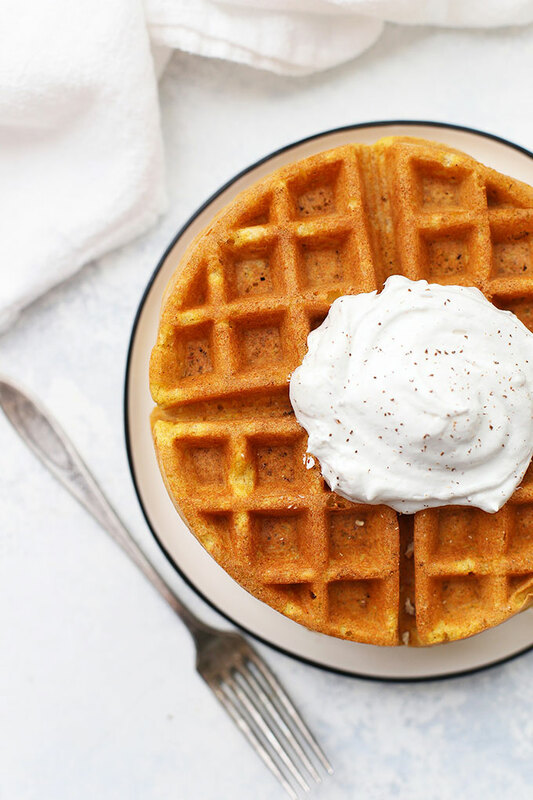 These crispy, fluffy almond flour pumpkin waffles are exactly what I’m talking about. They’re all the good things about waffles. And they taste amazing, whether you drizzle them with maple syrup, sprinkle them with toasted pecans, or dollop a big spoonful of whipped coconut cream on top. They’re pretty darn nutrient dense. Almond flour has healthy fats, protein, vitamins and minerals that white flours or all-purpose gluten free flours tend not to have. They are more filling, which makes them a great option. They’re also gluten free, dairy free, and naturally sweetened. The texture is AWESOME. My dream waffle is crispy on the outside while light and fluffy on the inside. 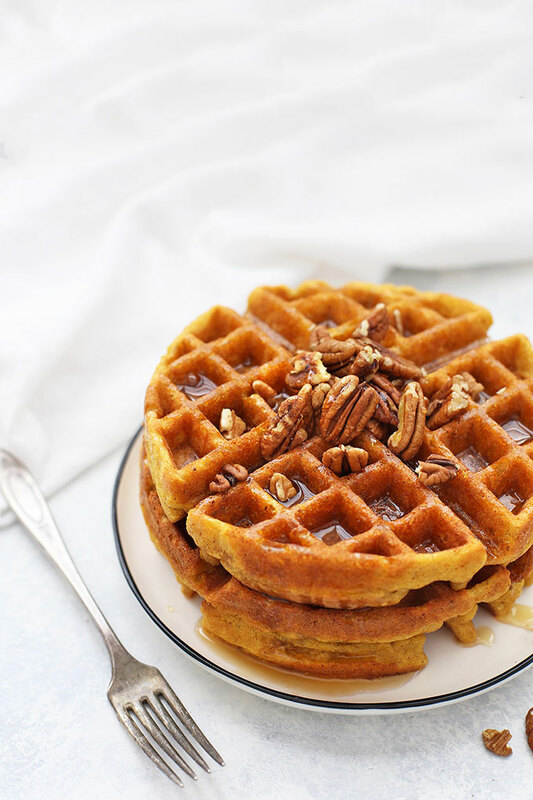 These pumpkin waffles are both. For Best Results – Use blanched, finely ground almond flour. I like Honeyville, Wellbee’s, and Anthony’s. I love Bob’s Red Mill’s other products with my whole heart, but their almond flour is a bit grittier and not as finely ground. Almond flours vary in density, and a good way to get consistent results is to measure properly–fluff the flour with a spoon/whisk/fork, then scoop with a spoon into a measuring cup (rather than scooping with your measuring cup, which can compact the flour). That said, the BEST WAY to get perfect waffles is to weigh your ingredients with a kitchen scale. Keep Your Waffles Crispy! If you’re cooking waffles for a crowd and want to keep them crisp, try placing them in a single layer on a cooling rack, rather than stacking them. Stacked waffles tend to steam each other, which softens that gorgeous crispiness of the outside layer. You can also put them in a low-heat oven (about 200 degrees F). I put my cooling rack on a baking sheet and pop the whole thing in the oven to keep them warm and crisp. Freeze & Reheat Leftovers – We freeze leftover waffles ALL the time. They’re great for quick weekday breakfasts, and we also toss them in packed lunches. To freeze, make sure the waffles are completely cool, then stack them one layer at a time in a freezer-safe bag. I put a sheet of parchment paper in between layers to keep them from sticking to each other. (You do you!) To reheat, pop them in the toaster, or put them on a baking sheet in a 350 degree oven for 5-10 minutes. Waffle Irons – If you’re in the market for a waffle iron, we’ve owned FIVE in our 10.5 years of marriage. (cue: all the eye rolls. Believe me, I’m right there with you.) This is my pick for a standard, fairly thin waffle. This Mickey waffle maker makes the PERFECT kid-friendly sized Mickey-shaped waffles. And this Belgian-style waffle maker will give you amaaazing Belgian style waffles (and it cooks 2 at once!). The Mickey Waffle iron is the favorite for my kids, and the Belgian iron is my overall pick. Paleo Notes – If you’re strictly paleo, you’ll need to be sure to use a paleo-approved baking powder option. (Baking powder tends to contain cornstarch, which isn’t paleo approved.) You can make your own, which only requires arrowroot powder, baking soda, and cream of tartar. 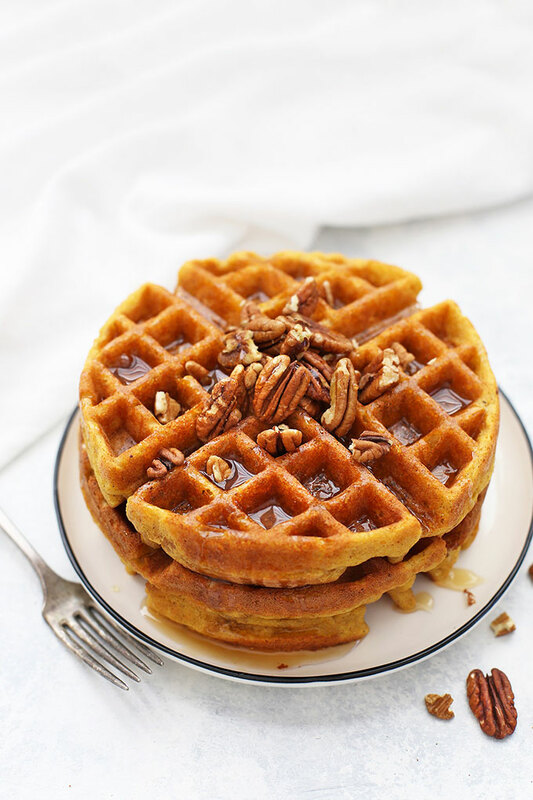 Crispy & fluffy pumpkin waffles made with almond flour. 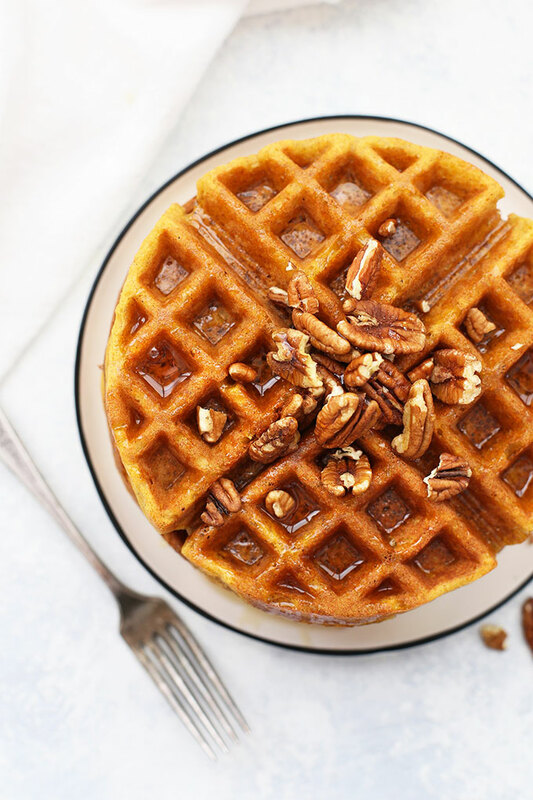 These healthy pumpkin waffles are so good, we eat them year round! Preheat your waffle iron and grease with nonstick spray or brush with a very thin layer of oil. In a large bowl, whisk together almond flour, arrowroot, baking powder, cinnamon, nutmeg and salt until well combined. Add pumpkin, milk, syrup, eggs, ghee/oil, and vanilla. Whisk to combine well. Scoop batter into your waffle iron and cook according to your waffle maker instructions. Repeat with remaining batter until all the waffles are cooked. Freeze & Reheat Leftovers – We freeze leftover waffles ALL the time. They’re great for quick weekday breakfasts, and we also toss them in packed lunches. To freeze, make sure the waffles are completely cool, then stack them one layer at a time in a freezer-safe bag. I put a sheet of parchment paper in between layers to keep them from sticking to each other. (You do you!) To reheat, pop them in the toaster, or put them on a baking sheet in a 350 degree oven for about 5 minutes. Waffle Irons – If you’re in the market for a waffle iron, we’ve owned FIVE in our 10.5 years of marriage. This is my pick for a standard, fairly thin waffle. This Mickey waffle maker makes the PERFECT kid-friendly sized Mickey-shaped waffles. And this Belgian-style waffle maker will give you Belgian style waffles. Paleo Notes – If you’re strictly paleo, you’ll need to be sure to find a paleo-approved baking powder option. Baking powder tends to contain cornstarch, which isn’t paleo approved. You can make your own, which only requires arrowroot powder, baking soda, and cream of tartar. Woh mama. The fat content is the fats for my whole day!! I am still going to make them, maybe I will do this on a Sunday. They really look delicious. We LOVE them! I keep trying to make extra to freeze, and we go through them so fast! We’re making these this morning. Love the taste, but they keep sticking to the waffle iron and won’t cook through before burning. Does this batter not work with a thicker style waffle maker? Jane – Oh no! I made mine in my deep Belgian iron, so they do work with a thicker waffle. Every iron cooks a bit differently, so sometimes if there’s temperature variation the batter will “seal” differently when it hits the plates. Did you spray your iron with nonstick spray first? Do you know what temperature setting you had it on? I’d love to help! In general, if you still have sticking after spraying it or brushing it with butter/oil, you might need to add a tiny bit more oil to the batter to help with the sticking. Or adjust your waffle iron temperature. I hope some of those tips help! I’m cheering for you! Stefanie – That IS a bummer. I’m so sorry that happened for you! Oh wow! Yum! Want to make today,except I do not have arrowroot or tapioca and can not purchase in my town. Can it be omitted or substituted? 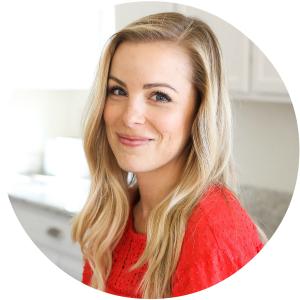 Kristen – Not for a paleo option, but if you’re not following paleo, you could use cornstarch or another starchy flour (like rice flour). You can usually find Arrowroot in the Spices or try Walmart Superstores i know they sell it in with the Spices and i have seen it at Dollar Tree here in Michigan so you might try looking at your local Supermart Spices but to get half cup buy more then one jar of it the spice jars are usually small. I have never seen it in the larger more common spices offered at most grocery type stores and just a bet Whole Foods may carry it. Or check on Amazon or Amazon Prime i know you will find it there. Made these today and they were absolutely the best waffles I’ve ever had! Loved them. YES! I’m SO glad you enjoyed them so much. THANK YOU for sharing!!! These are delicious tasting , I just couldn’t keep them from sticking so bad I ended up with chunks of waffle pieces in a bowl…. they would stick to both sides of iron and I had to scrape them out…. I tried a ton of oil on iron and it still didn’t work . Have no adjustment for temp on my iron just plug in and wait until light comes on. Jamie – I’m guessing this is related to your waffle iron temperature. Since your waffle iron doesn’t have adjustable temperature, you may be able to solve the sticking problem by adding additional oil to your waffle recipe and continuing to grease the iron itself. I’d start with an additional Tbsp. of oil in your actual recipe, and go from there. If it’s still sticking, you can add additional oil a bit at a time. I do hope that helps! The waffle itself has a nice texture and is quite attractive. 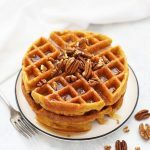 Another almond flour recipe I had used previously was a little too “light” and airy so I liked that this recipe produced a waffle with more weight, yet still being fluffy. The raw dough was very stiff but I was able to spread it with a butter knife and used a double cook cycle on the waffle iron, which is not unusual for the model I use. I would like a more pungent pumpkin taste; perhaps the brand of pumpkin might be important. I used the Whole Food 365 organic pumpkin puree. Is it a good idea to increase the amount of pumpkin puree and to decrease liquid elsewhere in the recipe? Hmm… good question. I worry that if you increase the pumpkin (and decrease the milk to compensate) that the batter would be too dense and heavy, and may scorch during the cooking. You could possibly decrease the spices to allow the pumpkin flavor to come through? Or, if it’s the pumpkin spice flavors you’re after, could increase the spices to give a stronger pumpkin spice flavor. Absolutely wonderful. Probably some of the best waffles I’ve had, paleo or otherwise. I wish they made more– doubling the recipe next time! I’m so glad you liked them! Thank you so much for sharing! I just made these for breakfast and they were delicious. I topped them off with fresh banana chopped pecans and paleo powdered sugar. Oh yum! That sounds heavenly! These are definitely some of the best gluten free waffles I’ve had! So yummy! I LOVE hearing that. Thank you so much for sharing! I love everything I’m reading about this recipe!! Can’t wait to give it a try tomorrow! Question, not a big pumpkin flavor fan, what could I substitute with, that won’t impact the texture of the results? I see the pumpkin puree is 1/2 cup. Thank you! We love them! As for adapting the recipe…pumpkin is pretty essential to the structure. The only suggestion I could think of would be pureed bananas. I’m not sure if that’d be any better for you flavor wise, but it might be worth a try! Can I make this recipe minus the pumpkin? Also can I just make pancakes instead of waffles? Cristin – It sounds like you’d be happier with a different recipe. This one needs the pumpkin for structure. You could probably get away with making them as pancakes, but I haven’t tried it. Best of luck! I loved these! My only suggestion would be to make the waffles on the smaller side, about half the size of the waffle iron, so they can cook all the way through. I halved the recipe and added ground flax seed to mine since I didn’t have the arrow root powder and I was only making it for two. The smell alone while these cooked was amazing. Amy – That’s a GREAT suggestion. Thank you for sharing! I saw you mention replacing arrowroot/tapioca starch with cornstarch, should we do this as a 1:1 ratio?